Find here Anchor and crew coupons and deals. 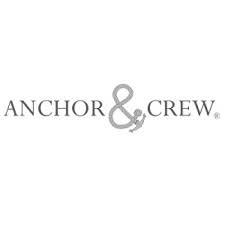 ANCHOR & CREW is the Accessory House of Great Britain with fans in 85+ countries. For the Modern Journeyman (and woman), ANCHOR & CREW is an award-winning jewellery / anchor bracelet / leather goods / accessories brand, and offers 800+ products. Combining British craft manufacturing with a discerning modern-minimalist style, ANCHOR & CREW is multi-award winning ever since 2014 and believes in having a highlyethical and traceable supply chain. Taking ownership of an exploratory lifestyle and enjoying the Happy-Good Life, our celebrated craftsmen create unisex jewellery, accessories and lifestyle goods for the Modern Journeyman (and woman). Timelessly British by design and manufacture, ANCHOR & CREW is particularly known for our anchor bracelets, leather bracelets and rope bracelets, amongst other quality accessories.